The first match of the year saw us at Dillington and with it being mild and the pond coloured I was hoping it would fish well. Everybody had plenty of bites but the whip boys dominated and Justin Charles on the end peg won with 13lb 6oz and he had some quality roach. I sneaked into third place with 9lb 13oz and just edged out Baz Morgan, taking a pound off him in the process. We were back at Dillington for the second match and I got off to a great start but my swim faded as the day went on and I just couldn’t catch any quality, I ended up with 102 fish for 7lb 12oz for nowhere. 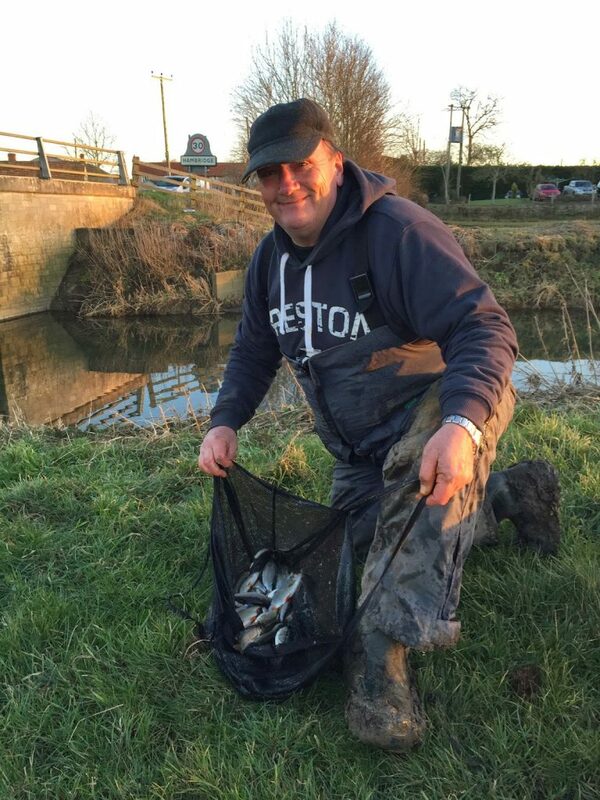 Baz Morgan won with a nice net of fish weighing 12lb 3oz which included several good skimmers, some proper roach and a decent perch. We actually got back on the river for round six of the V.E.S. League, I drew peg 109 at Redbridge and was expecting chub after Tony Newman won the Xmas Fayre with four of them for 11lb odd. I had a decent roach first chuck and continued catching all day, at one stage I had visions of doing a really big weight but it tailed off a little towards the end. I still ended up with a lovely bag of mainly roach for 21lb 4oz and my first win of the year. For the first match of the month, strong winds were forecast and it looked like we were in for an unpleasant day, I managed to draw a sheltered peg in the shape of peg 125 and had another fantastic days fishing catching 11lb 14oz of roach, dace, chublets and gudgeon for second place behind Baz Morgan who had my peg from last week and weighed 14lb 8oz. I bumped enough fish to win it and I’m sure that if I’d have fished the waggler I’d have caught nearer 20lb. The following weeks match was the open and it was nice to see a few new faces with Jamie Parkhouse, Paul Homewood and both Scott and Roger Russell hoping for a nice days fishing. I really fancied another crack at peg 109 but drew a peg at Hambridge which was pegged for the first time in ages. The swims all looked nice but after three hours I only had a few small fish for less than a pound. I walked down to see how the others were getting on and Andy Welch, Paul Homewood and Baz Morgan were all bagging up! I was feeling a little demoralised but thought that if those three framed there was a chance of snatching the section by triple default! I sat back on my box and first chuck the float buried and I landed a pound chub, six more followed between one and three pounds plus a few roach and it was like a different swim! I weighed a level 13lb but then Andy weighed 16lb 11oz, Paul plonked a stunning 20lb 13oz of roach on the scales before Baz trumped everybody with a staggering net of mainly quality roach weighing 29lb 6oz. I ended up in fourth place just ahead of Hurf who had 12lb 4oz from peg 126. Some really good weights but the much fancied 109 didn’t bother weighing which just goes to show what a fickle beast the river can be. The final V.E.S. Precision match arrived with Heardy leading it followed by Rob then Fieldy and me, I got the dream start drawing peg H5 at Hambridge, the weather was awful and although I had a nice bag of fish weighing 11lb 7oz which included a lovely 2lb perch, I finished well down the section finishing fifth out of seven pegs! 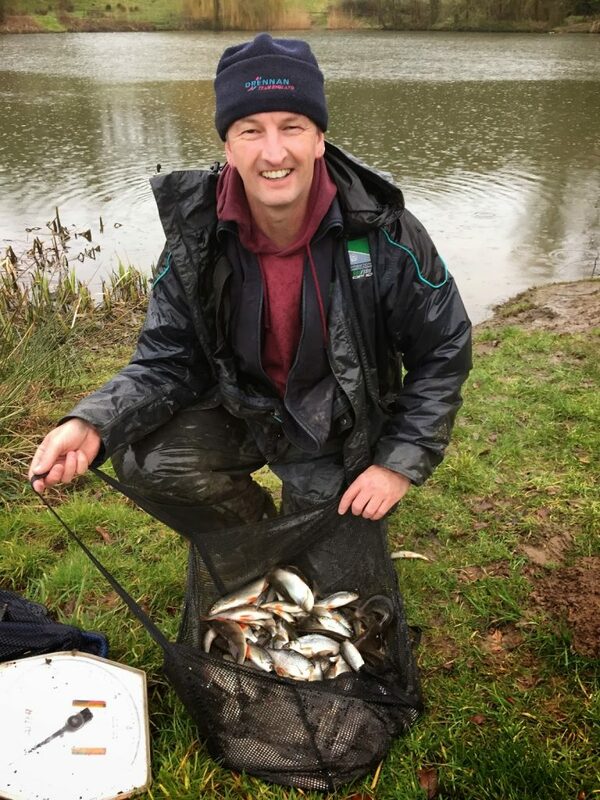 Justin won with a lovely net of quality fish weighing 25lb 5oz and also won the golden peg fund, Paul Homewood was second with 24lb 1oz and Rob Cox third with 18lb 12oz. Fieldy won the league with 13 points followed by Rob with 14 and Heardy with 15. Justin won with a fantastic net of quality fish weighing 25lb 5oz and for good measure it was a golden peg too! For Barney’s Pairs Open I was with Justin and he would fish the river while I would be on the pond, he drew peg 4 for me and I had a lovely days fishing catching some quality roach, rudd and perch on caster for 14lb 8oz and a lake win, just edging out Bruce Hunt who had 13lb 10oz. 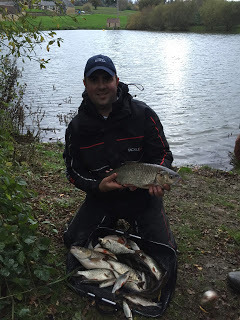 Justin struggled for 8lb 8oz from a mediocre peg and we ended up with 7 points but just sneaked into third place (on weight) and we picked up £22 each. Bruce and Martin Heard won it with 4 points and Robin Cox and Fieldy were second with 6. Next up was a rod only match out at Dillington with the aim to try and target some of the bigger fish, it didn’t really happen and I struggled for 4lb 13oz which was enough for second place behind Hurf who had 6lb 9oz. I also had to keep fending off a very angry goose! My first visit of the year to Summerhayes saw me draw a great peg on Longs in the shape of peg 12 and I had a next peg battle with Scott Russell who took the verdict with 40lb 14oz to my 35lb 7oz and we ended up third and fourth respectively. A poor last hour cost me when I should have fed a new line but hindsight is a wonderful thing. I picked up £18 plus a pound off Janders and also finally one off Glynn Wickham although he did a runner without paying. We were back at Summerhayes the following week with the match spread over Sellicks and Lily, I drew exactly where I wanted, peg 5 on Sellicks but struggled for a few skimmers and a crucian for 4lb 15oz and nowhere, mind you I missed/lost enough to win it as 11lb 2oz was the top silvers weight. Janders had a bit of a nightmare, he was pegged on Lily and had ten carp for 25lb odd but had lost twelve and 26lb was last in the money! The last match of the month was at Summerhayes and I was back on Sellicks, this time on peg 4 and despite awful weather it’s fished well and I’ve caught all day to end with 27 skimmers and 8 carp for 38lb 12oz and second on the pond behind Steve Kedge with 51lb 10oz from peg 14. I picked up £35 and Janders had a nice day too, coming second in the silvers on Longs with 26lb of bream. Lowlights – That bloody goose out the pond! Day one of the two day pairs mini festival saw me on peg 3 on Longs and I had a nice day catching my best silvers weight yet with 26lb 7oz of big bream and skimmers and I also had a nice tench, I was second in my section and my partner Ray was third in his which put us in a good position going into the second day. The second day saw Ray draw spot on with peg 3, I was on 23 which can throw up some silvers weights but is more of a carp peg. I struggled for six skimmers for 6lb 11oz but it was enough for second in the section and with Ray winning the other section with over 15lb, we won the silvers with eight points and picked up £48 each. Martin Addicott and Dave Bull won the carp and only dropped one point over the two days, a great performance. I was back at Summerhayes on Wednesday but the day got off to the worst start when we heard Clive had passed away at the fishery the previous day. I drew a great peg and had a good first half of the match but couldn’t catch for the last two and a half hours, Janders won the silvers with 20lb 8oz and I had 14lb 3oz and missed out on second by 2oz! I was really looking forward to the Gary Bull fundraiser which was being held at Summerhayes, there were 49 anglers booked in including England international Des Shipp. I drew peg 19 on Longs and found four big slabs and a few skimmers for 19lb 13oz for second in the silvers on the day. 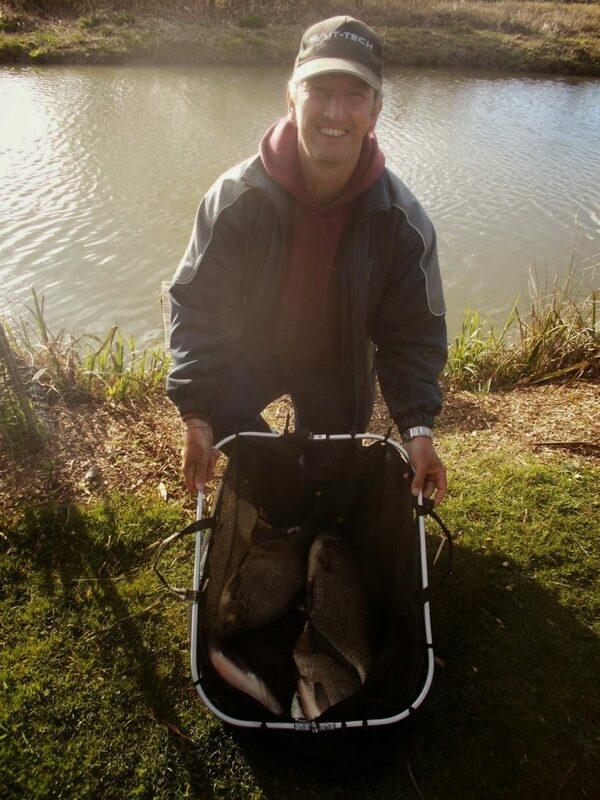 Des won from peg 37 on Longs with 81lb 1oz (89lb actually but he went over in his carp net). Over £530 was raised which was a fantastic result and I’m looking forward to the next one already. Then on Sunday I was back with Janders for my fifth match in eight days, I had a master plan to avoid Lily and it didn’t work with the last peg in bucket, peg 7 on Lily. I did catch two nice bream and some bits for 11lb 8oz but missed out on third in the silvers by 9oz! I got off to a great start in the first league match at Perry St with nine carp on pellet shallow for 41lb 10oz, second place and a nice pick up of £80. Paul Blake had the top weight on the day with 44lb which included a 2lb 6oz eel. Round two was the following week and I was in peg 4, an empty peg on my right was a bonus and I had five carp shallow and six down the edge for 34lb, fourth on the day and £40. I got just the start I wanted on day one of the two day mini festival at Summerhayes when I drew peg 2 on Sellicks, it was quite tough going but I managed 14 skimmers for 12lb 6oz and a silvers win to put me in pole position for the second day. I was hoping for a decent silvers peg on day two but didn’t get it when I drew peg 15 on Longs, I just couldn’t catch skimmers and ended up with a lowly 2lb 6oz plus 28lb of carp! I blew right out and was gutted to suffer from the curse of the second day yet again. Ray Wickham won the silvers overall with 7 points and Andy Hembrow took the carp honours with 5 points. 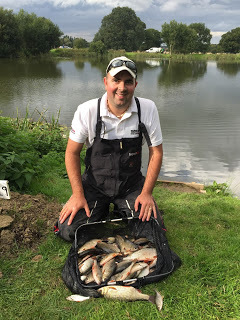 Round three of the Perry St league saw me have a right next peg battle with Jamie Parkhouse, he came out on top with 67lb 6oz to my 61lb 2oz but I still ended up in second place and picked up £80 which was very nice. It was round four the following week and I was happy with peg 6 but it was quite tough going and losing my first carp didn’t help. I ended up with nine carp for 29lb 12oz and a default section win. Then it was back to Summerhayes for another two day pairs mini festival, with the fish spawning they just weren’t interested in feeding. I ended up with three carp for 9lb 3oz and 4 pts and two skimmers for 1lb 1oz and 4 pts. Going into day two my partner Ray Wickham and me were lying in second place for the carp with 7 pts and fourth in the silvers with 9 pts. Day two arrived and it looked like the carp had finished spawning so hopefully it would fish a bit better. Ray drew peg 18 on Longs and I had 19 on Sellicks which can be a good skimmer peg. With no fish after 45 mins I started to fear the worst again but then I’ve had a skimmer and caught fairly steadily all day I ended up with eighteen skimmers and three accidental carp. The scales started on Longs and Ray had done brilliantly to finish second on the lake with 14lb 1oz behind Rob Birch with 14lb 6oz. There was a 14lb 4oz on my lake so I was relieved when my weight was called at 15lb 2oz, I won the silvers superpool and picked up a very welcome £65 and we actually tied on points with Rob and Mark Leahy but they took the verdict on weight and we finished in second place and picked up £45 each. So a lovely days fishing and a nice little pick up. I was back at Summerhayes for the last match of the month and hoping for another nice days silvers fishing. The trouble was we were on Longs and I’ve struggled on this lake of late, I drew peg 28 which is in a decent area but got battered both sides by Rob Birch and Ray Wickham and I just couldn’t catch decent skimmers and didn’t trouble the scales. The highlight of the day was catching a lovely little crucian carp of around 12oz. 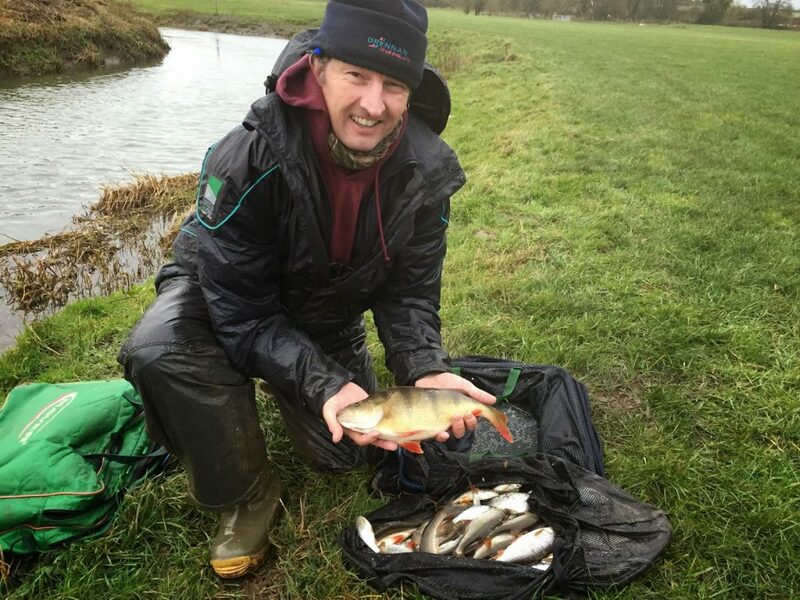 The first match of the month was round five of the Perry St league and with loads of carp cruising around, it looked like they might have spawning on their minds. It was hard going and I ended up with nine carp (five which I mugged, much to Les’s disgust!) for 38lb 8oz and I finished second behind Jamie Parkhouse who weighed 61lb 2oz and also caught most of his fish by mugging/stalking. Round six was the following week and I knew I had pegs 18 and 20 to come at some point and neither have been great, when Les opened the envelope, it put me on 18 and I wasn’t expecting great things. Jamie P on 17 bagged all day to win with 97lb 6oz and battered me in the process but I wasn’t too upset as I won the section and five points was a much better result than I was expecting off that peg. 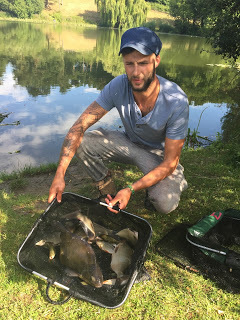 I was really looking forward to fishing Dillington for the first time in ages the following week, I had a nice days fishing catching 136 fish for 13lb 12oz but came nowhere. 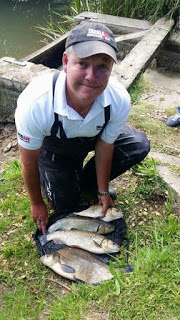 Scott Russell had a cracking day and won with four bream, three chub and 8lb of roach for 33lb 15oz from peg 1. My final match of the month was back at Summerhayes but on Longs where I seem to have lost my way of late. I drew peg 34 which is a great silvers area and when my third fish was a decent skimmer I thought I might be in for a good day. I also thought meat might solve the small fish problem but after what seemed like a million missed bites I ended up with 24lb of carp and just 1lb 15oz of silvers for nowhere. Round seven of the Perry St League put me on peg 10 which is the best peg on the pond, I ended up with sixteen carp for 57lb 2oz and second place behind Blaker who had an excellent 78lb 10oz from peg 16. The icing on the cake was taking another nugget off of the Torquay Tart who finished third with 55lb 4oz. Back on Longs the following week and I actually managed to catch a few silvers for a change and also had a lovely little golden tench along with a green one for 8lb 5oz, third in the silvers and my first pick up on Longs for ages (plus a pound off a certain Mr G Wickham). I did lose/bump a few fish as well which cost me as Mark Leahy was second with 8lb 13oz. Alvin Jones had the best silvers weight with 12lb 12oz and Chris Bolton won on the day with over 70lb of carp caught shallow. 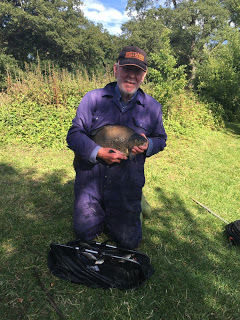 I was fairly pleased when round eight of the Perry St League put me on peg 14, I wasn’t quite so pleased when I was still blanking after two and a half hours! I eventually started getting a few lumps from my inside line on meat and my five carp weighed 26lb 10oz for fourth and £40, I did lose two decent fish due to schoolboy errors which would have put me a lot closer to Chris Haines’s winning weight of 36lb 10oz. The penultimate match of the league put me in peg 20 which hasn’t done a lot all series, I’ve caught quite well on meat at 5 metres and 13 metres towards the end bank and had another head to head with Jamie P. I just came out on top this time and finished second on the day when my fifteen carp weighed 57lb 9oz to his 49lb 15oz, we were both a long way behind Blaker who had 93lb 2oz (although he was only admitting to 50lb!). Lowlights – Always the bridesmaid and never the bride! For the first match of the month I was back at Dillington and with lots of bream and skimmers being caught on feeder tactics I actually dug out my tip rod and a reel. I should have known better as bright and sunny conditions were far from ideal for bream and I spent too long on the feeder with only a single skimmer to show for my efforts. After two hours I switched to the pole line which I’d fed from the start and caught roach, rudd and perch steadily for the remainder of the match to end up with 144 fish. I was convinced the two hours I’d wasted on the tip were going to cost me but I weighed 13lb 2oz which was just enough for victory in a very tight frame with Stu Alford second with 12lb 9oz and Jake Woodard was third with a bream and skimmers for 12lb 6oz. I had a lovely days fishing with plenty of bites and picked up £43. The final match of the Perry St League was next and I was on peg 2 with Blaker on peg 8 and despite my two point advantage I had him down as the slight favourite going into the match and that was basically how it panned out. I had the top weight at my end of the pond with 30lb 12oz but he won the match and the league with 50lb 4oz with four of the five top weights coming from pegs 8, 9, 10 and 11. Still I picked up £40 for winning the section and £90 for second in the league and had enjoyed a cracking series with an envelope every match. After a great result in the last match at Dillington I was hoping for more of the same in round eight, I drew peg 13 and couldn’t catch on the feeder and when I switched to the pole, I couldn’t catch on that either! 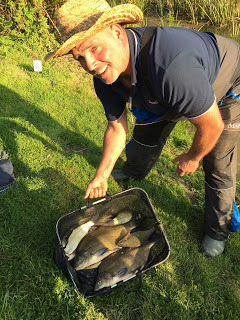 Frank Woodard won with a lovely net of bream, skimmers and a 2lb tench for 20lb 14oz from peg 10 and Jake was second with a similar net of feeder fish weighing 20lb 1oz, Fieldy filled the last frame place with over 300 fish on two sections of pole to hand for 17lb 13oz. The next match was a rover on Longs at Summerhayes and I ended up choosing peg 2, I caught some good skimmers, crucians and a golden tench mainly on 6mm banded pellet for 14lb 13oz and a silvers win. Bill Hopping broke the match record with a massive 190lb 5oz of carp on paste from peg 24. 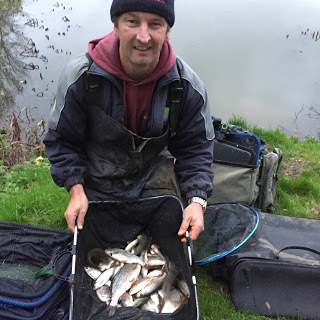 My final match of the month was back at Dillington and I struggled once again for 7lb 7oz for nowhere, Stuart Alford won with a nice net of bream and skimmers weighing 20lb 10oz on feeder tactics from peg 6. Lowlights – Not winning the Perry St League! I was back at Summerhayes for the first match of the month and it was on Sellicks and hard going, it didn’t help that I fished it all wrong and my 4lb 3oz of silvers came nowhere. Bill Hopping had another nice payday with 109lb 9oz of carp which won him another golden peg. 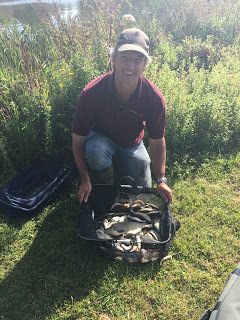 Next up was the final match of Ilminster AA’s Summer League, I drew peg 24 which has a bush to the left which holds some big chub but they can be very hit or miss so I decided to fish for roach in open water, I caught well for two hours then struggled for the next two so had to have a go for those chub. I lost the first one which looked ready for netting but dived under the keepnet snapping the hooklength in the process and when I lost the second one under the bush, things were looking grim. With an hour to go I finally landed one around the 2lb mark and with five minutes to go I hooked a lump which I landed just before the all out. I weighed 12lb 7oz which was enough for third on the day and out of interest I weighed the big chub which was 4lb, a new personal best. 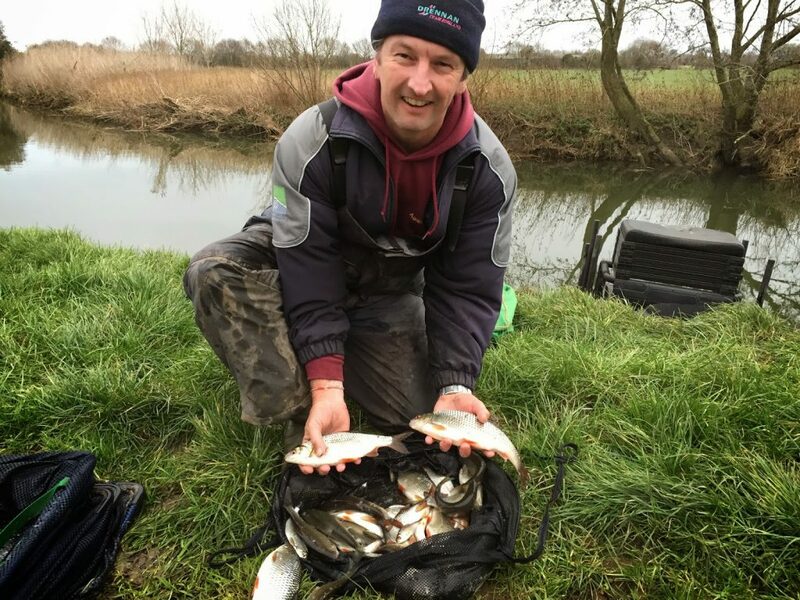 Tackleuk’s Ashley Tomkins had the top weight on the day with 16lb 10oz of clonking big roach and Frank Woodard was second with a nice net of skimmers weighing 12lb 14oz from peg 18. Graham Field won his section again and was crowned the Summer League Champion. I was back at Summerhayes on Longs the following week and drew peg 29, after a steady start I struggled for 6lb 9oz of silvers and 26lb of carp for nowhere. Bill Hopping continued his great from with another win, this time with 86lb of carp from peg 2, Ray Wickham had the best silvers weight with 12lb 10oz from peg 7 and Roger Russell was second with 10lb 8oz which included a big eel of 3lb plus that took a hard pellet! My final match of the month was a pairs open at Dillington and I really wanted to do well as a tribute to my dear Mum who sadly passed away on the Friday morning. I started okay but couldn’t keep the fish coming and I finished well down in my section with 7lb 14oz, my partner Fieldy also blew out with 3lb 7oz. Frank Woodard had the top weight on the day with 12lb 5oz proving he’s still the man to beat and also him and Jake won the pairs. Lowlights – Losing my Mum. I was really looking forward to getting back on the river and although peg 22 wouldn’t have been my first choice, I was fairly happy as I’ve wanted to fish it for a couple of seasons, despite it looking nice, I never had a bite and recorded my first blank of the year! 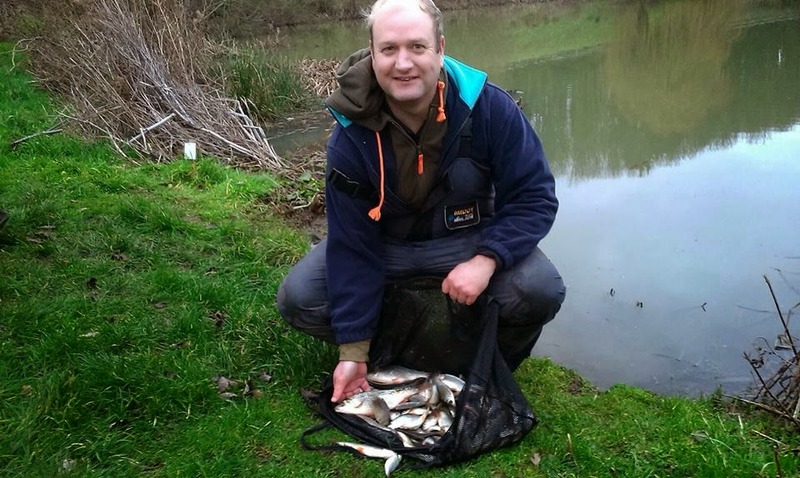 Karl Aplin won, fishing his first match with the club, with 8lb 1oz from the tank traps. The first V.E.S. match saw us all pegged at Redbridge and Isle Brewers, I had a wish list of pegs but I drew 123 and that wasn’t on it! I had a bite every put in, but mostly from gudgeon, I had a chub right at the end which boosted my weight to 5lb 9oz but it wasn’t enough as Big Frank won the section with 6lb 2oz. Neil Dring won the match from peg 120 with 12lb 2oz, Justin Charles was second with 11lb 13oz from 126 and Graham Field was third with 8lb 13oz from 125. We were back on the river and I got the dream start when I drew peg 126, one of the best pegs on the river, I had a bite a chuck all day but mainly from gudgeon, dace, chublets along with the odd better roach. I ended up with 125 fish for a level 6lb which was good enough for second place although a long way behind Justin Charles who had a lovely net of quality roach plus a good chub for 23lb 4oz from peg 129. The last match of the month saw us back on the river and I drew a peg above the road at Hambridge that struggled for ounces the week before, I was still quite hopeful though as we’d had quite a bit of rain the day before. When I got to the river though, it was low and clear and another struggle was on the cards, I caught three nice perch late on plus a few bits for 2lb 3oz and nowhere. 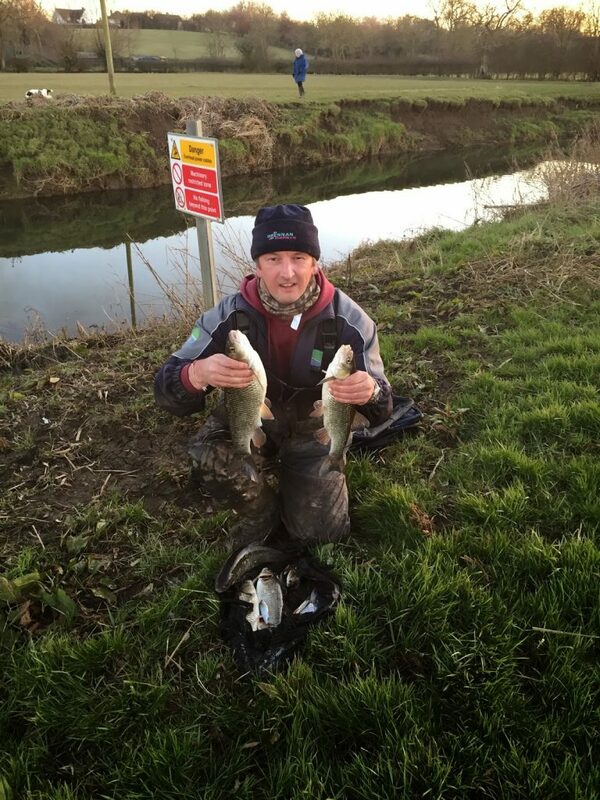 Paul Homewood won from below the bridge with a lovely net of fish weighing 15lb 6oz which included some cracking perch. After some much needed rain I was really looking forward to the first match of the month, I drew peg 82 at Ashford and it looked lovely, I lost a decent dace or chublet early on and also saw a big chub and I was sure I’d be in for a good day. Then the bullocks arrived and after an hour and a half where they wouldn’t leave me alone I moved to the next swim down in the next field and caught three small chublets for 3oz! Bruce Hunt won with a lovely net of fish weighing 12lb 9oz from peg 14, Rob was second with 4lb 13oz and Hurf had 4lb 9oz for third and I’d walked away from a framing peg today! 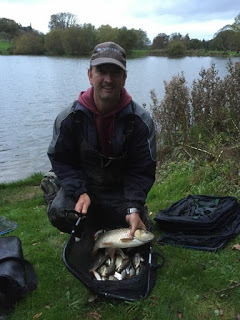 After a load more rain we were at Dillington for the next match, I had a really enjoyable day catching some nice roach, rudd and perch on the pole and caster from peg 2 for 13lb and second place. Jake Woodard won with a cracking net of mainly skimmers but he also had a lovely tench, a big perch and an eel for a total of 24lb 7oz, Jake caught on the feeder with pinkie hookbait. We were back out the pond the following week as well and it’s fished even better with lots of bonus chub and bream featuring in catches. Tackleuk’s Ashley Tomkins won with a fantastic net of quality roach and four chub weighing 24lb 7oz with the biggest chub pulling the needle round to an impressive 4lb 8oz. 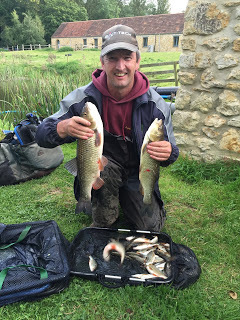 Graham Field was second with 18lb 2oz which included five chub and Steve Hurford was third with bream and skimmers weighing 16lb 5oz on the feeder. I had another really enjoyable day but my 14lb was only good enough for a section win. The river was in perfect condition for the next match with some much needed colour and pace and I really fancied the pegs downstream of Hambridge but of course pulled out the one above the bridge, it can be a good swim but I felt it was too early for it. I’ve had bites all day to end up with 86 fish for 5lb 2oz and nowhere, Heardy won with 13lb 15oz of mainly roach from peg H2 below the bridge and Rob was second with 10lb 13oz from the peg next door. 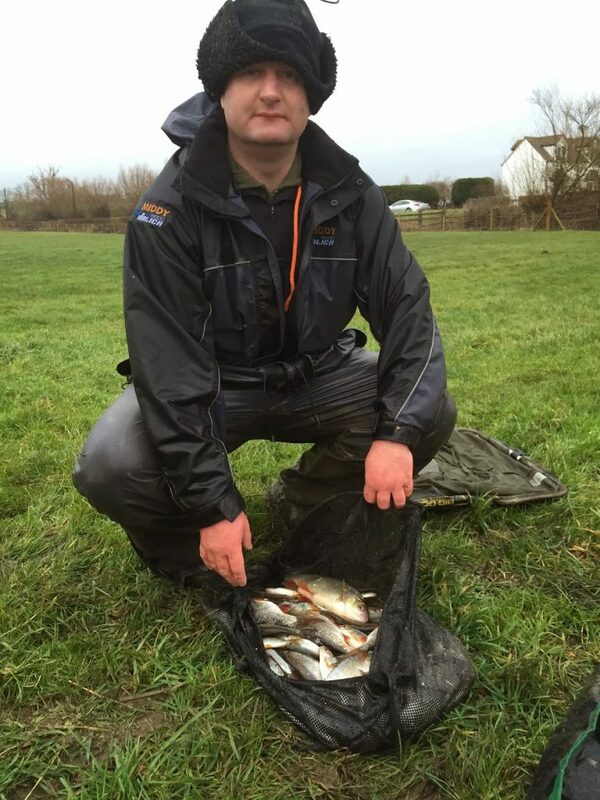 The last match of the month was fished on the Isle in horrendous conditions with the wind threatening to blow us off the bank, Rob drew for me and pulled out 129, a brilliant peg (cheers mate), I caught roach, dace, chublets and gudgeon all day and finished up with 122 fish, I thought I had around 15lb and was slightly disappointed to weigh 12lb 3oz which put me second behind Graham Field who had a lovely net of quality roach weighing 14lb 5oz from peg 128. The first match of the month was the Xmas Fayre and it was well attended with 17 anglers fishing, Rob put us all round the pond and it fished well, I had a lovely day catching some quality roach, rudd and perch for 9lb 15oz and second place behind Justin Charles who had a nice perch and some big skimmers for 15lb from peg 17. 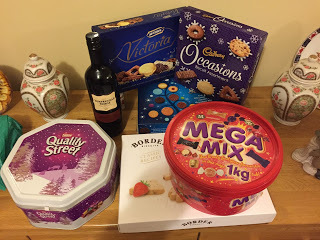 I picked up £30, a bottle of wine, four boxes of biscuits and two tins of chocolates, what a great prize. All the anglers enjoyed a lovely buffet at the Royal Oak and a lovely gesture was the club donating the peg fees to The Brain Tumour Charity. 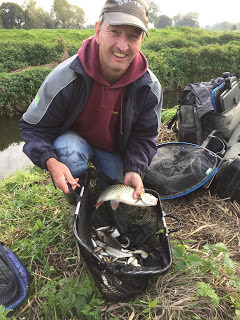 In the next match, I actually managed to draw downstream of Hambridge for the first time, it was solid and I’ve had a bite a chuck (and some pike trouble) to end up with 196 roach, chublets, dace and gudgeon for 11lb 15oz and third place behind Rob who had 15lb 4oz and Fieldy who had 16lb 11oz and they’ve both had some decent perch to boost their catches. For round four of the V.E.S. Precision league we back out the pond and although I fancied a nice open water peg, I drew peg 1 which has a bush and some resident chub. I had a chub and a decent skimmer early on but then struggled for a few roach and lost a good fish on my light rig before catching a ‘get out of jail’ 3lb plus chub with ten minutes to go. I finished with 8lb 6oz which was good enough for second place and £40 behind Paul Homewood who won comfortably off a golden peg with 13lb 1oz of skimmers to take home a nice envelope. 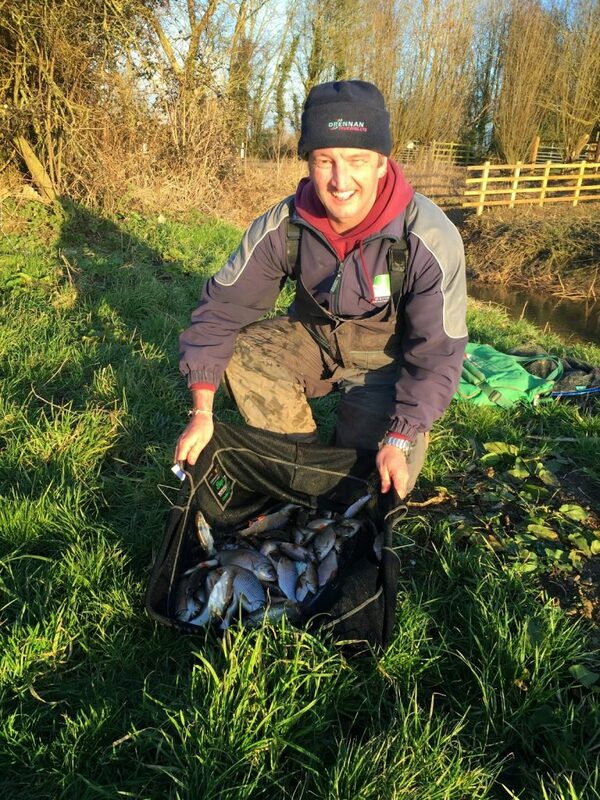 The final match of the year saw us have a knock-up at Dillington, Scott Russell won with a lovely net of roach weighing 16lb 13oz from peg 20 and I was second with 144 fish for 13lb 10oz from peg 18. Lowlights – Always the bridesmaid! Looking back at my review of last year, I had lots planned for 2015 but after my Mum became seriously ill, all those plans went out the window. I never made it to Thailand this year and trips after new species just didn’t happen. I did manage a few trips after mullet with Hurf and Russell Hilton but they proved as elusive as ever. On the match front, although I only won two matches, my winnings total was my second best ever with some good results along the way including a really good Perry St League where I picked up an envelope every match and finished second overall. I’ve been really enjoying the matches at Dillington as it continues to evolve into a fantastic natural venue and the river is full of small fish at the moment, ensuring plenty of bites. The blog goes from strength to strength and has flown past 318,000 hits as we head into the new year and I’ve had some great feedback both online and from people I’ve met on the bank. Pondip asked me to pen some articles for their site which I’ve enjoyed doing and I can’t not mention Hayley from Bait-Tech who continues to be really helpful and supportive of the blog and it was lovely to meet her at the Big One once again. So as I bid farewell to 2015, which on a personal level has been the worst year of my life, I’m looking forward to next year where I’m planning to head to Thailand early in 2016 and there’s also been talk of the possibility of fishing for sturgeon in Canada later in the year which will be amazing if it happens. Weird, this just popped up on my blogroll even though you posted a day ago. Blogger is strange at times. Looks like a good year. Looking forward to your posts in 2016. Happy New Year.